We’d love your help. Let us know what’s wrong with this preview of The Key of F by Jennifer Haskin. Though Fale has never discovered who murdered her parents and left her orphaned as a child, she attempts to lead a normal and peaceful life. After all, she is training to be a peacekeeping warrior under the direction of her adoptive father. But, when she starts having strange visions that predict the future on her 18th birthday, it turns her life into anything but ordinary Though Fale has never discovered who murdered her parents and left her orphaned as a child, she attempts to lead a normal and peaceful life. After all, she is training to be a peacekeeping warrior under the direction of her adoptive father. But, when she starts having strange visions that predict the future on her 18th birthday, it turns her life into anything but ordinary. Alongside her best friends and the man who rejected her three years ago, Fale must discover the truths of her past to achieve her true destiny. To ask other readers questions about The Key of F, please sign up. From the synopsis I assumed there would be a bit of a love story in here, but I didn't expect the MC to be perceived so weakly as a result. A teen-aged warrior, who just discovered she has magical powers and a giant mystery from her childhood...I expected Fale to be more badass. The love story was a bit too all consuming and it took away from Fale's personality. This is only book 1 and it ends with an adventure on the rise, so I have higher hopes for the next book. Having read many popular YA fantasy-dystopians, I’ve begun to recognize certain recurring themes. The “not-like-any-other-girl” teenaged main character, the brooding love interest, the woulda-coulda best friend, unfair and random class systems and a totalitarian government. I could go on. The list is LONGGG. From Divergent to The Red Queen, most current YA dystopians contain variations on the same tune. YA is so riddled with these writing cliches that a twitter account @DystopianYA has emerged Having read many popular YA fantasy-dystopians, I’ve begun to recognize certain recurring themes. The “not-like-any-other-girl” teenaged main character, the brooding love interest, the woulda-coulda best friend, unfair and random class systems and a totalitarian government. I could go on. The list is LONGGG. From Divergent to The Red Queen, most current YA dystopians contain variations on the same tune. YA is so riddled with these writing cliches that a twitter account @DystopianYA has emerged to hilarious result. Unfortunately, Jennifer Haskin’s The Key of F falls into the same trope-y trap. But thankfully with the book’s accessible writing and fast-paced plot, I kinda didn’t mind. Our main character, Fale, was raised by an adoptive father after her parents were murdered. That point aside, Fale’s life is pretty standard. As an adult, she intends to join her country’s peacekeeping force. She lives in a pretty awesome apartment. And courtesy of her adoptive father, Nelson, she has access to a big chunk of change. Really, Fale’s only worry is her crush on an unobtainable, angsty hunk o’manliness. In other words, she’s a normal teenager. However, on her 18th birthday, Fale’s quiet life is abruptly torn asunder when she becomes plagued with psychic visions. When Fale uses those visions to cheat death, she sets off a chain. A chain that will change her life, and the lives are her friends….FOREVER. The Key of F’s success is due in large part to its clear, uncomplicated writing. I’m so over fantasies where it seems the author’s main objective is to create the craziest, most nonsensical words EVER. What’s with these extensive, unpronounceable names and titles composed primarily of vowels that all look vaguely welsh?! If as a librarian I can’t decipher them, what hope does Joe Schmo have? In this book, character names are unique, yet remain comprehensible. I can actually follow the plot without having to google every two seconds. THANK YOU, LOKI. While discernable writing, a fast-paced plot, and an interesting societal structure are highlights, characters and relationships are a drawback. Fale is a typical “not-like-any-other-girl” protagonist. She starts off the book as a generic teen, yet little does she know she’s THE CHOSEN ONE. Like the book legit says: “you were not just any girl, but you were an extraordinary secret.” Can just once a fantasy-dystopian feature a regular person with no special powers who defeats the enemy with decent work ethic? Why isn’t that a thing??? Fale, apart from her super-special-magicness has no distinguishing characteristics. It’s difficult to describe Fale or identify with her when she’s just so….vanilla. Really, she’s no different than any number of YA fantasy-dystopian heroines. But worse than bland Fale is Fale’s relationship with the broody, angst-filled Keron. Keron, our unattainable hunk o’manliness, is a fantocci. The guy needed a limb(s) replacement and Algea has worse insurance coverage than the USA, so he’s forced into lifelong servitude to repay his debts. In the book’s rigid, random caste system, fantocci are the lowest of the low. Untouchables, basically. This fact allegedly accounts for Keron’s dark, somber personality. I say, give the man a zoloft and let’s call it a day. Nevertheless, Fale is drawn to Keron’s "secret depths." The Fale-Keron romance vacillates between rom-com trope and forced antagonism. It’s like 27 Dresses meets The Hunger Games. And the lines spouted by both Fale and Keron are cringe-worthy. For example, “You make me feel whole. Like a real man and not a machine. Not a possession.” Really, dude? REALLY?! But cliched lines aside, the more offensive part of this romance is how ridiculous Fale becomes whenever she’s in Keron’s presence. Fale, allegedly all “I’m a woman, hear me roar” devolves into a driveling Bella Swan-esque mess when Keron’s near. “We’re probably making him jealous as it is, Lisle. He’s not very good at sharing.” Since when did women become a possession to be traded back and forth? Sorry gurl, your “independent woman” act just doesn’t work when you espouse such ridiculous beliefs. And then there’s Fale’s utter obliviousness about her bestie Lisle’s true feelings. A BLIND MAN CAN TELL LISLE HAS THE HOTS FOR FALE. He literally says: “I get sad because princesses always look for a warted frog to kiss and find love, but overlook the wizard saving her life, because he loves her.” Number #1: dude, get a grip. And number #2: WAKE UP, FALE. I'm seriously concerned about your ability to successfully lead a revolution when you can't detect the world's most obvious crush. UGH. The Key of F is basically Traci Chee’s The Reader crossed with Divergent and finished with a sprinkle of Harry Potter. Really, despite it’s flaws, it’s a fun read. The concept, while perhaps overly ambitious, is interesting. And there’s enough fight scenes, intrigue, and action to keep male reluctant readers engaged. In summary: worth a read. My summary: In The Key of F, Takanori Warrior and eighteen-year-old Fale starts receiving visions of the future that become increasingly clearer each day. But it seems she's not the only one able to see her visions, and soon, the group that dominates this dystopian civilization puts a hit out on her and a close friend. The story mostly follows Fale and Keron as Fale learns who she really is and why Control is after her. 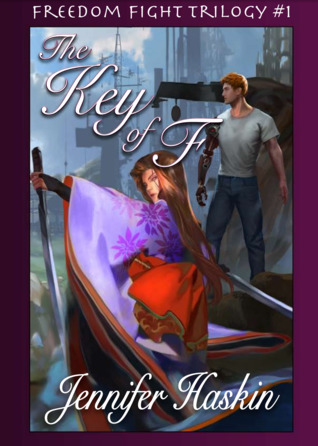 My Review: There were a lot of things I liked about The Key of My summary: In The Key of F, Takanori Warrior and eighteen-year-old Fale starts receiving visions of the future that become increasingly clearer each day. But it seems she's not the only one able to see her visions, and soon, the group that dominates this dystopian civilization puts a hit out on her and a close friend. The story mostly follows Fale and Keron as Fale learns who she really is and why Control is after her. 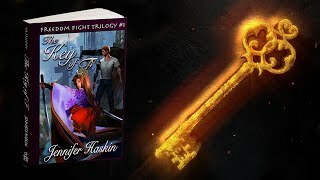 "The Key of F" is book one of a fantastic YA Fantasy Series. 18-year-old Fale is an orphan warrior who has visions that predict the future. Fale is a character teens can relate to. Yes, she's special, but she's also awkward, genuine, and frightened. The secondary characters are fantastic as well, especially Fale's love interest, Keron, and her best friend Izzy. It's obvious Keron has feelings for Fale, but he keeps her at arms length, and Izzy I received an ARC in exchange for an honest review. 18-year-old Fale is an orphan warrior who has visions that predict the future. Fale is a character teens can relate to. Yes, she's special, but she's also awkward, genuine, and frightened. The secondary characters are fantastic as well, especially Fale's love interest, Keron, and her best friend Izzy. It's obvious Keron has feelings for Fale, but he keeps her at arms length, and Izzy is a best friend anyone would want. The story line is awesome - Fale realizes she's a princess with special powers who has to battle with a wizard. This review has been hidden because it contains spoilers. To view it, click here. First of all I really love the story's settings. While some may complain about the clichés (the chosen one, the divided and oppressed society, etc), I say it's all about the twist you put on it. And I like that twist. Then the writing is of quite good quality. It could gain from a little pruning on the descriptions, but it's nothing that hampers the story. The reading flows easily, and that's 50% of the book for me! And finally the story line. It's quite good, the characters are NOT stupid, whic First of all I really love the story's settings. While some may complain about the clichés (the chosen one, the divided and oppressed society, etc), I say it's all about the twist you put on it. And I like that twist. And finally the story line. It's quite good, the characters are NOT stupid, which is a rare trait. Maybe too rare, because they Fale does make a couple stupid decisions, but it's really OK. However, when I reached the end of the book is realized this made for a bland storyline. Whatever Fale does, she always gets out of it unharmed, with all her stuff, she never suffers any setback. Well except for Keron. Honestly that guy is to be punched. He's a real weathercock, and having 1 random paragraph of his POV at the end of some chapters make him even more annoying. The one thing I missed from this book is side stories. The other characters are shallow, they how no depth and barely a wisp of background. *I received a free ARC in exchange for an honest review of The Key of F! First off, I want to say that I really, really enjoyed this book. It’s pretty unusual for me to read fantasy for fun- usually I go for a contemporary or historical fiction, but books like this make me remember why I always end up looking fantasy. There’s something about fantasy- the worldbuilding involved, the magical qualities, and the unpredictable plots- that draws me in every time. And The Key of F successfully hit all of *I received a free ARC in exchange for an honest review of The Key of F! There’s something about fantasy- the worldbuilding involved, the magical qualities, and the unpredictable plots- that draws me in every time. And The Key of F successfully hit all of these points. I want to talk first about the worldbuilding and plot. After all, as I said above, those are key in fantasy novels, at least for me. The worldbuilding is done really well in The Key of F! Sometimes when I’m reading the first book in a fantasy series, I truly feel as if I’m reading a history textbook. I can’t take in all the new information, so then I’m confused for the rest of the book. As a reader, I appreciated how spread out the introduction to the world was in The Key of F, and how a lot of it was blended in with the character’s natural conversations. AND THE PLOT. The plot. It's a crazy ride. Unpredictable! Twisting, and turning! It was like being on a rollercoaster, in a good way. I truthfully could not have predicted anything that happened, and that made the book a thousand times better. I also really liked the writing style. The writing style appealed to me, making reading The Key of F enjoyable. I liked the use of dialogue to move the plot along- it worked nicely. I ended up liking the third person narration more than I thought I would. Even though it wasn't in first person, it provided me with lots of insight on what was going on in Fale's head. The main character, Fale, was definitely my favorite. I love her character. IT IS AMAZING to read a book with such a strong female character! Fale is independent. She’s strong. She’s a warrior (literally- she’s a warrior in the book). I find it amazing that after all the hardships she’s faced, after being orphaned as a child, she’s still willing to face more. She wants to fight, and I love that. Besides the fantasy aspects of the book, romance also plays a pretty large role. Unfortunately, I wasn’t the biggest fan of the love interest, Keron. As the reader quickly finds out, Fale and Keron have a history between them. I started off disliking Keron because of this history, but as the book progresses I did grow to like him more. As he and Fale rebuild their relationship, he does become more likable. However, I didn’t like how he was so controlling of Fale. It’s his job to protect her (his task is to be her bodyguard of sorts), but I felt like he spent too much time telling her what to do instead. At the end of the day, I personally felt like he was stifling Fale’s desires to be independent, and that’s why I just couldn’t grow to love him. Overall, I thoroughly enjoyed this book! It provided great fantasy elements, a strong main character, and overall just kept me on the edge of my chair. I can see myself rereading it, and I’m excited for more books in the series to come in the future. *I received a free ARC of this book in exchange for an honest review. The Key of F is a YA dystopian novel containing some familiar themes but with a unique spin to them. Fale, our protag, is a teenage girl with teenage girl problems (i.e. guy trouble, struggles with self-image, etc.) All things most of us can relate to. However, she lives in an alternate universe in a country called Algea, that is separated into cities according to what they contribute to society. Her start in life was not the *I received a free ARC of this book in exchange for an honest review. The Key of F is a YA dystopian novel containing some familiar themes but with a unique spin to them. Fale, our protag, is a teenage girl with teenage girl problems (i.e. guy trouble, struggles with self-image, etc.) All things most of us can relate to. However, she lives in an alternate universe in a country called Algea, that is separated into cities according to what they contribute to society. Her start in life was not the best being that she was orphaned at a young age. But after a friend of her father takes her in, life seems to go ok for her. She even trains to be a peacekeeper, which is a group that does just what the name implies, “keeps the peace” within the country. Everything changes for Fale on her eighteenth birthday when she starts having visions that appear to be premonitions. These visions start a chain of events that send Fale on a journey of struggle and self-discovery, all with a supernatural twist. The world that Jennifer Haskin has created is a big part of what makes this story such a fun read. There are some common dystopian-esque elements which may feel familiar (a big brother-like government force that monitors every aspect of the lives of its citizens, in this story aptly named “the control”) but this world really is unique in so many ways. The hierarchy of their society was quite interesting. There are the respectable members of society and then there are the “Fantocci” who have been injured in some sort of accident. They are forced to replace their human limbs with bionic ones, the expense of which they pay back by essentially turning their lives over to the control and “working it off” for the rest of their lives. The Fantocci are considered subhuman at best, but our progressive heroine happens to fall for one of them, the hunky muscle-bound Keron. And so, the romantic subplot ensues and keeps us wanting throughout the entire story up to the very end! Another strong element to this story were the characters. Fale is not your average damsel in distress. She is a strong female heroine who is more than capable of taking care of herself. Her peacekeeper training has seen to that. Even so, the depth of her character is such that she is strong, yet fragile in many ways. As an orphan, she has a strong desire to feel like she belongs. She was also raised by a man, and missed out on the relationship talks and makeup tips that mothers and daughters typically share. She is very inexperienced in this way and it makes her all the more endearing and relatable. The supporting characters are all solid as well, each of them having their own interesting back stories. As a result, we have an eclectic mix of human and supernatural characters, each with their own strengths and weaknesses. It makes for a fun ride. The Key of F is an ambitious young adult novel that straddles a number of genres. It has the intensive surveillance and the high-tech body modification of science fiction. It has the wizards and mages and the Chosen One narrative of fantasy. And it has the makeovers and petty jealousies of high school and college books. It's not until about half-way through the book that those three strands come together and we see where it's all been leading. The main thrust of the novel follows Fale, an orphan The Key of F is an ambitious young adult novel that straddles a number of genres. It has the intensive surveillance and the high-tech body modification of science fiction. It has the wizards and mages and the Chosen One narrative of fantasy. And it has the makeovers and petty jealousies of high school and college books. It's not until about half-way through the book that those three strands come together and we see where it's all been leading. The main thrust of the novel follows Fale, an orphan who has been entrusted with a mysterious key and who is on a quest to find her guardian and mentor, Nelson. But of course it's not as simple as that, and her investigations only present further missions. I did wonder whether her name, and 'Effailya', from which it's derived, could be a punning clue to where this series is eventually going to end up... We'll see about that one. She's variously helped and hindered by friends Keron, Izzy and Lisle, who represent other groups within the social makeup of Algea, and the differences between classes and occupations lead to some conflict between the four – something that will no doubt be explored further in later instalments. I was fascinated by the brief glimpses we got of the system that underpins this world: where people are forced to work in an environment that seems set up to seriously injure them, at which point their only option is expensive prostheses, which they then spend the rest of their lives paying off. It was a neat satire on certain real-life systems, and I'd have liked to have seen more exploration of it. But I was puzzled, too: daiquiris, lasagna, katanas and rock bands suggested the influence of an Earth culture that appeared never to have existed in this world. This one gave me serious Hunger Games vibes, but there's magic, so it's even better. Haskins has created a fantasy dystopia that is complex, but not too overwhelming. The storyline has lots of action and conflict, both emotionally and physically. Yet I appreciate Haskin's ability to write scenes of violence without being too graphic. Additionally, I love how the characters are flawed and make mistakes, making them e Disclaimer: I received a free copy of this book in exchange for an honest review. This one gave me serious Hunger Games vibes, but there's magic, so it's even better. Haskins has created a fantasy dystopia that is complex, but not too overwhelming. The storyline has lots of action and conflict, both emotionally and physically. Yet I appreciate Haskin's ability to write scenes of violence without being too graphic. Additionally, I love how the characters are flawed and make mistakes, making them easy to empathize with, and also leaving room for them to grow and develop over the course of the series. I met the author, Jenn Haskins, (virtually) before I found this book, and she's a really nice, and equally talented lady. This book is fantasy, and starts with a girl called Fale, whose biggest problem in life is being rejected by the guy she has a crush on. After messing up fate's path and saving her crush's life, she's forced to go on the run and handed a destiny of her own. One that she's not sure she can handle. Haskins blends in scifi with her fantasy world, which adds I met the author, Jenn Haskins, (virtually) before I found this book, and she's a really nice, and equally talented lady. Haskins blends in scifi with her fantasy world, which adds depth to the story she's telling. One of the main characters has robotic parts, which earns him a less-than-human status. There's scientific advancement, but there's also magic hidden in its corners. Both elements play equally major roles. If you enjoy reading YA fantasy then this book is for you. The talented author, Jennifer Haskin, has created a world full of engaging characters that face a dark and dangerous society. Fale, the spunky heroine, is drawn to her mission with determination and passion. The story moves at a rapid pace and unfolds a tale of not only magic, wizards, and warriors, but also an enticing romance. The dialogue is crisp, and the characters are well developed. I'm certain you'll find yourself rooting for Fal If you enjoy reading YA fantasy then this book is for you. The talented author, Jennifer Haskin, has created a world full of engaging characters that face a dark and dangerous society. Fale, the spunky heroine, is drawn to her mission with determination and passion. The story moves at a rapid pace and unfolds a tale of not only magic, wizards, and warriors, but also an enticing romance. The dialogue is crisp, and the characters are well developed. I'm certain you'll find yourself rooting for Fale and her circle of valiant friends. I am eagerly anticipating the next installment of the Freedom Fight Trilogy! Highly recommend!! There was so much I loved about this book...It got right to the good stuff quick and stayed there! The writing is truly unique style. Oftentimes I found it reminded me of a Wrinkle in Time with an amazing new world and lots to discover and unfold. I look forward to it being a series and continuing Fale's adventures. I really liked this book. The story was well told, the heroine was fresh and the drama, compelling. Even though YA is not my usual genre, I rally liked the way the story unfolded. Fale, who is as down-to-Earth as this is incredible, begins a journey to find out exactly who she is. When she starts having visions of the future and trying to do something about it, will she change it for the better or worse? 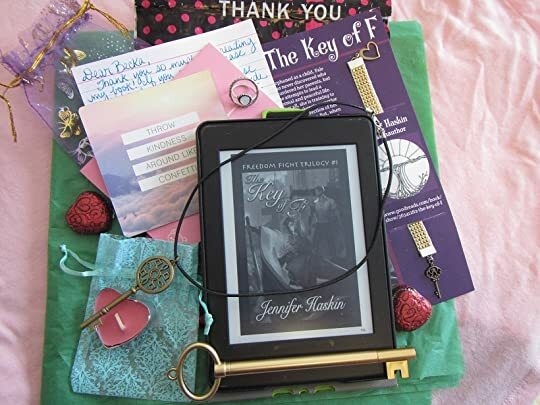 Really, I cannot say enough good things about this book - the storyline is well thought through, the dialogue is This week’s I Love Romance Blog review selection is The Key of F By Jennifer Haskin. With paranormal and sci-fi elements, this full-length novel is a great read. Really, I cannot say enough good things about this book - the storyline is well thought through, the dialogue is believable and relatable, and the interactions between the main characters keep you reading. "The Key of F" is book one of a fa Fale, Takanori warrior-in-training, begins having visions on her eighteenth birthday. When she realizes the visions are coming true, she intervenes and changes one to save the life of her crush. Soon after, thugs climb out of the woodwork chasing them with the intent to kill. Their only clue lies in the key Fale wears, given to her by her father on his deathbed. Could the key have something to do with her destiny? Can they live long enough to find the answers? Haskins has created a fantasy dystopia that is complex, but not too overwhelming. The story line has lots of action and conflict, both emotionally and physically. Haskins blends in sci-fi with her fantasy world, which adds depth to the story she's telling. The author has created a world full of engaging characters that face a dark and dangerous society. The dialogue is crisp, and the characters are well developed. My personal opinion is we have The Hunger Games meets A Wrinkle in Time; looking forward to see where this develops. A good start to what I hope will be a wicked action meets fantasy series. Fale is a young girl who is training to be a warrior while dealing with the usual teenage problems. She begins to have some strange visions hoping that she and her friends can understand what this means. Life takes a unexpected journey. This book held my attention and made me care what happens to Fale and company. Leaving me with a cliffhanger on what's going to happen next.